Out-of-Battledome healers are what you would expect from the name, they are single-use items that heal your pet outside of combat. It is normally best to try healing your pet at the Healing Springs first, however you may need to heal more often than once every 30 mins (e.g. during wars, events or tournaments). Below you can see all currently documented out-of-battle healers and may order them by their name or potency. Remember to keep in mind your individual healing needs and do not buy a healer which is too expensive. If you wish to know more about healing, you can visit our in-Depth Healing Guide. If you know any information that is missing from this guide please submit a bug report. Notes: Provides you with a full heal outside of combat, even during battle. This is in addition to the +1-3 max HP this item grants. 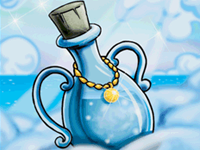 Notes: When used, this item either does nothing or heals your pet to full hit points.